Welcome to our monthly newsletter! 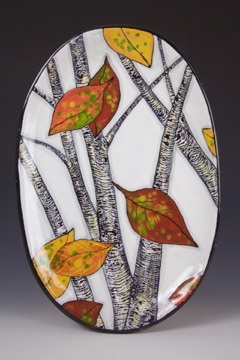 It is part of our website indigostreetpottery.com, which you can browse from this page if you click on the subjects in the header. We write here about our studio, arts events, projects, studios of our friends and garden musings. February 9 - April 15, 2018: 39th Annual Contemporary Crafts, Mesa Contemporary Arts Museum, Mesa Arts Center, Mesa, Arizona. Opening reception February 9, 6pm. 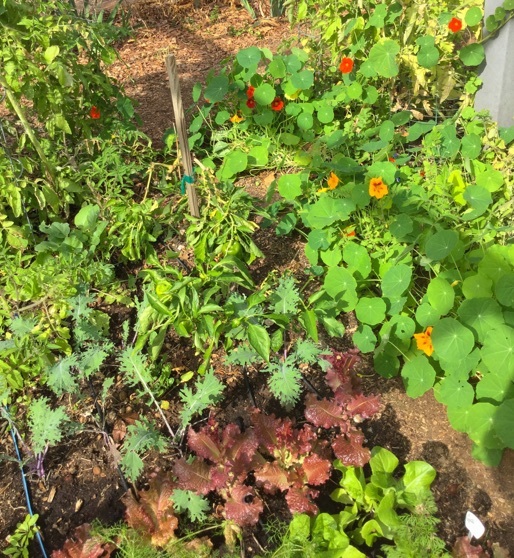 Because of this year’s mild winter, our kitchen garden has continued to support both warm and cool-weather vegetables and flowers. Colorful nasturtiums, whose flowers and leaves are a tasty, addition to salads, grow alongside lettuce, bell peppers and Red Russian Kale. 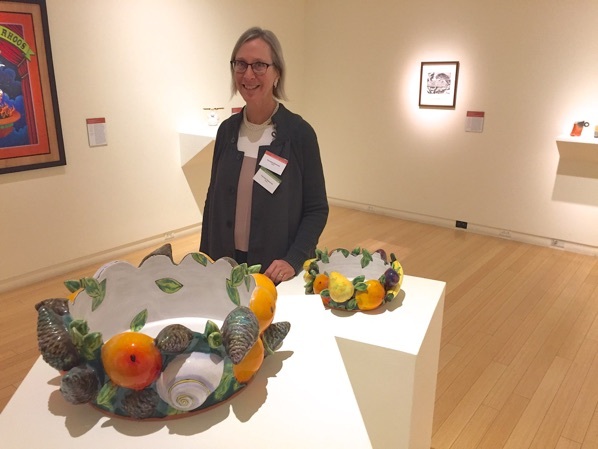 The current exhibition Docents Select VII: Kitchen Sink features artworks selected from the permanent collection of the Mesa Contemporary Arts Museum in Mesa, Arizona. Farraday Newsome has these two pieces in the show. They were selected from the permanent collection by Mesa Contemporary Arts Museum docent Jean Sammons. As with most museums, the Mesa Contemporary Arts (MCA) Museum Docents are central to the functionality of the museum. Through their volunteer efforts and assistance, tours are conducted, artwork is researched, special talks are prepared and opening receptions succeed. This exhibition was entirely curated by the MCA Museum Docents and demonstrates some of the research they have conducted on pieces from the permanent collection the center around the kitchen. Jeff Reich and Farraday Newsome on Peralta Canyon Trail, Gold Canyon, Arizona. 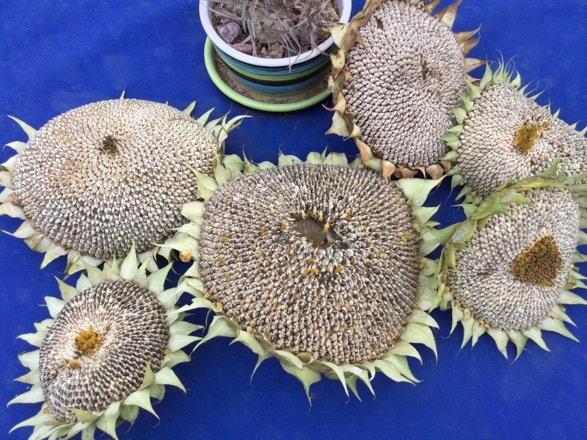 We let our sunflowers go to seed this year since we had virtually no frost to kill these large, warm-weather plants. These are the densely-packed, heavy seed heads, their yellow petals fallen long ago. We’ll let the seeds dry, saving some for ourselves and some to plant later this year. We also periodically put one out on a table for the birds. The curved-billed thrashers will strip an entire 14” wide head in one day! 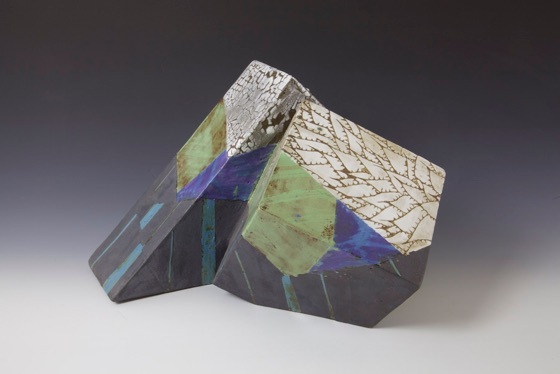 Jeff Reich and Farraday Newsome each have work in the nationally juried 39th Annual Contemporary Crafts exhibition currently at the Mesa Contemporary Arts Museum. Mesa Contemporary Arts Museum is the visual art exhibition space at Mesa Arts Center in Mesa, Arizona. The MCA showcases curated and juried exhibitions of contemporary art by emerging and internationally recognized artists. Highlighting the finest in contemporary crafts from across the country, Mesa Contemporary Arts Annual Contemporary Crafts exhibition has become a benchmark for innovation and quality. The exhibition showcases 51 artworks by 46 artists, representing 16 states. Arizona artists include ourselves, Carol Alleman, Jesse Berlin, Nicholas Bernard, Michael Cajero, Tatiana Fitzpatrick, Marla Hattabaugh, Jeff Heeg, Suzanne Hesh, Elliott Kayser, Jane Kelsey-Mapel, Laura Korch, Patricia Manarin, Robert Michaelski, Cynthia Miller, Sherie Monsam, Jason Ripper, Kazuma Sambe, Clare Verstegen, and Steve Wolf. When: February 9 - April 15, 2018. 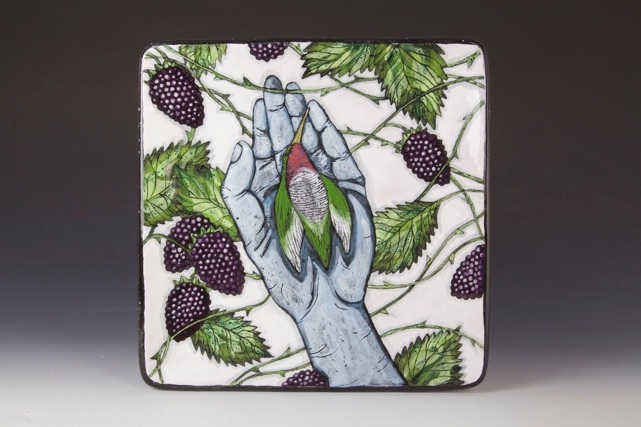 Farraday Newsome’s Brambles and Moths , above, will be in this year’s 22nd San Angelo National Ceramic Competition. 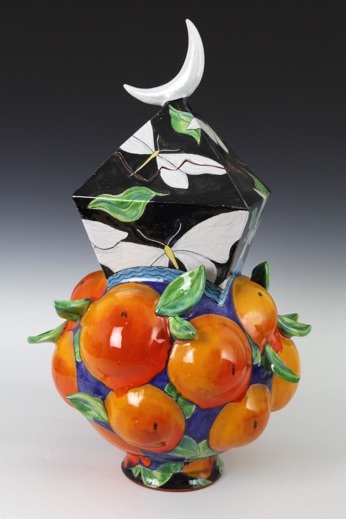 The San Angelo Museum of Fine Arts holds its San Angelo National Ceramic Competition every two years. This show is open to residents of Canada, the United States, and Mexico. The exhibition was juried this year by Peter Held, contemporary art curator and former museum director. 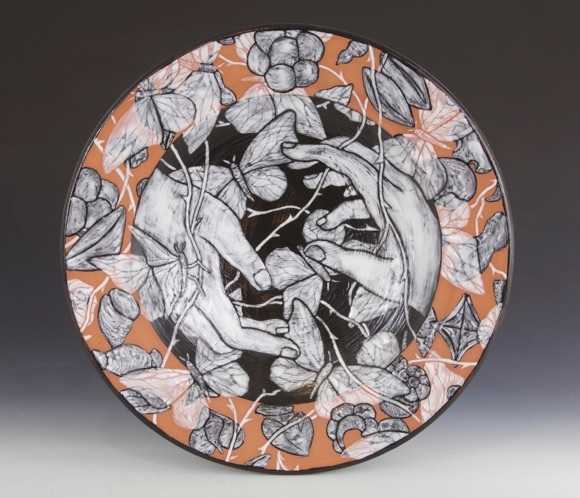 Mr. Held retired from his position as Curator of Ceramics, Arizona State University Art Museum, Ceramics Research Center in 2014 and now owns an art appraisal and consulting business in Phoenix, Arizona. 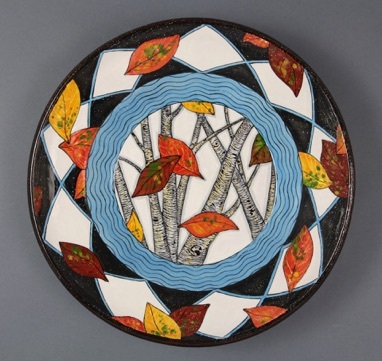 The show is the center of a weekend of ceramics-related museum events, including workshops, a symposium, show openings and a dinner. 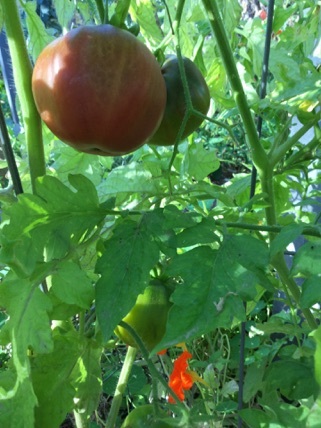 We started these heirloom Purple Cherokee Tomatoes from seed last fall. Perfect for our spring salad season! We’ve been planting and nurturing on our native-landscaped yard since we moved into our home/studio sixteen years ago. We started with a house (obscured by vegetation here!) and an empty acre-and-a-third lot that had been sorely abused by past occupants. It had been eaten to the ground by goats, then used to park semi-trailer trucks. 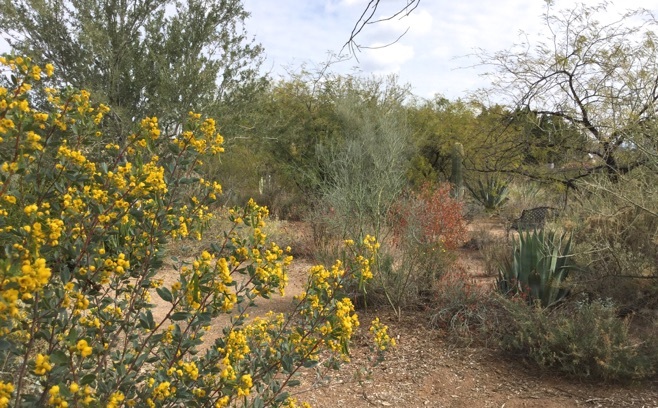 We are so happy to see the desert revived, providing habitat for native birds, insects, lizards, and us! It has been a dry winter, but we put in drip irrigation to the entire property when we first moved here, which helps tremendously. 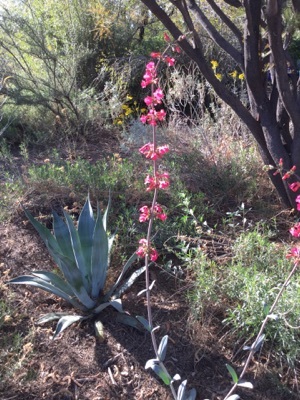 Above, our beautiful Coral Superb Penstemon (penstemon superbus). 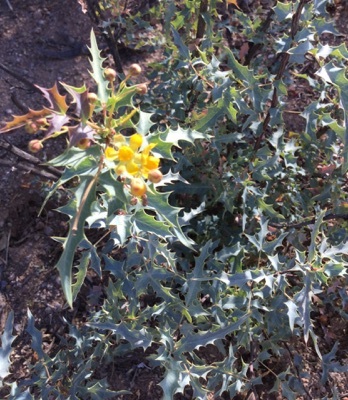 Our Desert Holly (Berberis trifoliata) is also blooming. 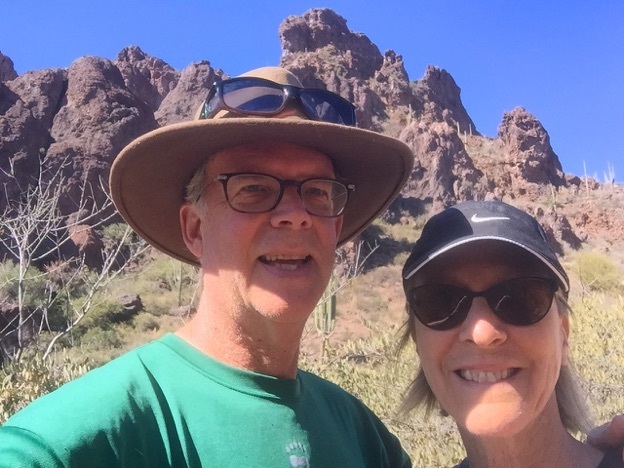 We saw some in the wild recently when we were hiking Peralta Canyon Trail in the nearby Superstition Mountains. The trail follows the steep drainage pattern of a narrow creek. The holly we saw wasn’t blooming, but the distinctive leaves were easy and delightful to spot. 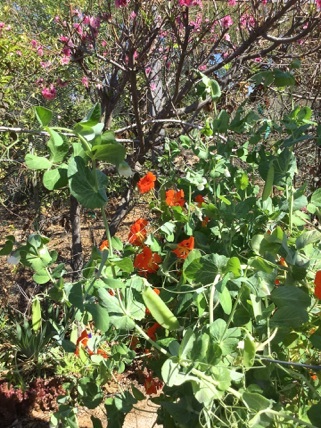 The climbing snow peas are intertwined with nasturtiums, and the Mid-Pride Peach tree is flowering pink in the background.